Hockey Plumber: What's in a Nickname? Sports Illustrated Photos put together a "Classic Hockey Nicknames" piece featuring 42 players, past and present. Although they got many obvious choices like "Rocket" Richard, "The Great One", Dave "The Hammer" Schultz and "Boom-Boom" Geoffrion, there were some glaring omissions. If one were to label something "Classic Hockey Nicknames" and leave out the following... for shame! Notable for his spot on the Production line with linemates Gordie Howe and Ted Lindsay. No player in NHL history played more games with just the one team. Tie Domi, "The Albanian Assassin"
Remembered fondly for his charitable contributions like the sucker punch that knocked out Ulf Samuelsson, then of the New York Rangers, pummeling an intoxicated Flyers fan as he fell into the penalty box and throwing an elbow at the head of unsuspecting New Jersey Devils defenseman Scott Niedermayer that knocked him unconscious. He was also know as "The Big Ball of Hate." In his NHL career, he scored 408 goals and 490 assists, for a total of 898 points in 1258 games in 18 seasons. 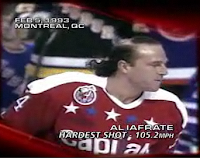 Known for his monster of a slap shot, and quite possibly the worst head of hair in the history of mankind. "The Little Ball of Hate", was given to him in 1995 by Glenn Healy after fellow New York Rangers teammate Ray Ferraro was tagged as the "Big Ball of Hate". 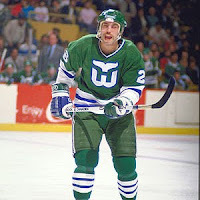 Verbeek is the only player in NHL history to total over 500 career goals and 2500 career penalty minutes. Complicating things, there were two Bob Kellys playing in the NHL during the 1970s. Both were near identical players - pugnacious left wingers known more for their fighting skills and corner work than their finesse abilities. As a result of their identical names and style, each player quickly became known by their nickname. Bob "Hound Dog" Kelly was a feared checker with the Philadelphia Flyers, "Battleship" for his work with the Penguins. Of course there are plenty of others, "Chico" Resch, "Jovocop", Dave "Tiger" Williams, etc... Yet, some nicknames seem to be regional, for example, I don't believe that Mark Recchi is known as the "Recchin' Ball" anywhere outside of Pittsburgh. Tell us some of your favorites in the comment section!